The bowling green at Kew Country Club has received a makeover to update its weathered surface from 1985. 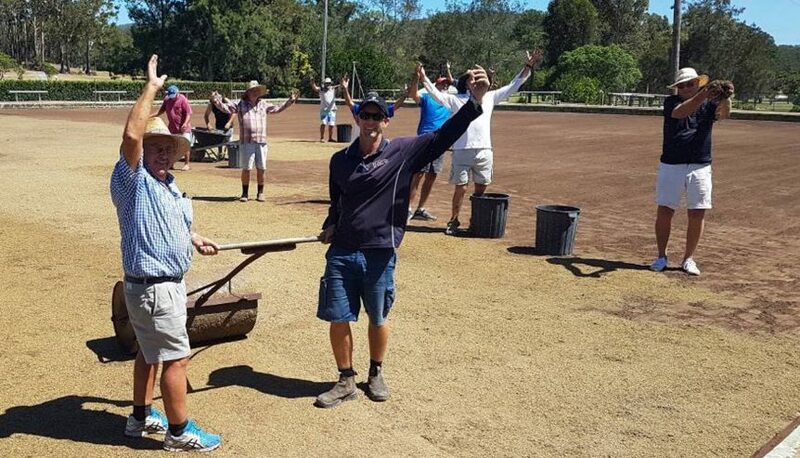 Fifteen volunteers from the Kew Mens Bowling Club laid the new turf at the Kew Country Club at the club on Tuesday, January 29. KMBC president Barrie Isaac said about four inches of material had been removed to level the site, making way for a grass pitch. Growing green: Golf course superintendent Brendan Hansard said the new surface could be ready to be used in 12 weeks. “Players like the grass greens which are a bit cooler on the feet, and problems can be fixed easier,” he said. “The majority of greens in the region are grass greens. “The bowling green carpet from 1985 had a bit of mildew and was looking rough. The green was originally leveled by Bruce Watts, who was the club’s first president alongside the first secretary, Bill Pickering. Laying down the green: Fifteen volunteers laying the new turf at the Kew Country Club. “Soil came from Logan’s Crossing upstream from the bridge, the green was planted with corings (cores of soil) from Wauchope Bowling Club,” he said.